About: Shakespeare's Head is pub that serves a variety of traditional English dishes and caters for private parties of up to 55 guests upon request. They also provide a range of entertainment including a juke box and fruit machines. Seating on the pavement area is provided, weather permitting. We found this pub truly by accident whilst looking for a place to have meal before going to a gig. We took a chance and found the food excellent the surroundings superb and the atmosphere friendly plus the staff very helpful.We will visit again as we live in west london. We have told our friends also about the pub and feel sure they will visit as well. 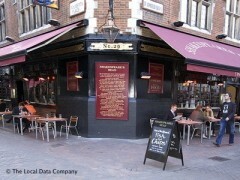 I found this pub by accident on recent visit to London. it was clean and welcomong if a little expensive. the tv in the corner rather spoilt the atmosphere but I would call again particularly as the venue felt safe to have a relaxed drink.